The goal of the team of chefs at LSG Sky Chefs that develops first-class menus for airline customers is clear: high-quality, classic and delicious. 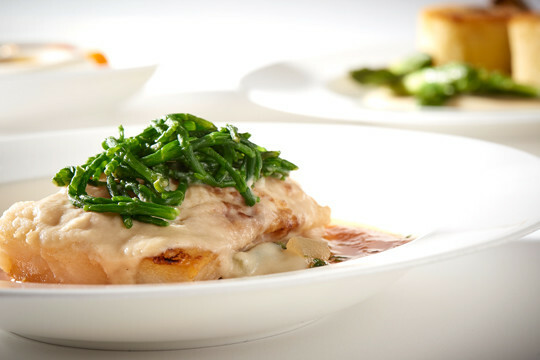 One of these is skrei fillet with beurre blanc. Executive Sous Chef Tim Hilchenbach from the Culinary Excellenece team is one of the members responsible for choosing the fresh fish. A glance at the fish calendar tells him which species is in season. In January and February it’s time for skrei, or Norwegian cod, as they undertake their annual journey from the icy Barents Sea to the warmer waters around the Lofoten Islands. To allow this quality fish to reveal its full flavor, the side dishes are deliberately kept simple and classic. For the beurre blanc, fry the mushrooms and shallots in butter, but do not allow them to color. Deglaze the pan with the vermouth, add the washed herbs and bay leaf and reduce by one quarter. Add the cream and fish stock and reduce again by half. Season the sauce with Dashi (or vegetable stock), salt and pepper. Strain the sauce and, if necessary, thicken it slightly. Season the skrei fillets with salt. Fry in vegetable oil and add a little butter. 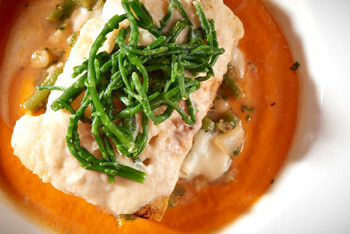 Serve the skrei fillets with the beurre blanc. Bean cassoulet, smoked paprika purée and samphire greens are also good accompaniments. The recipe serves 4 and takes 45 – 60 minutes to prepare.